Received 28 January 2011; revised 27 February 2011; accepted 27 March 2011.
the compound model of the Sun’s rotation. 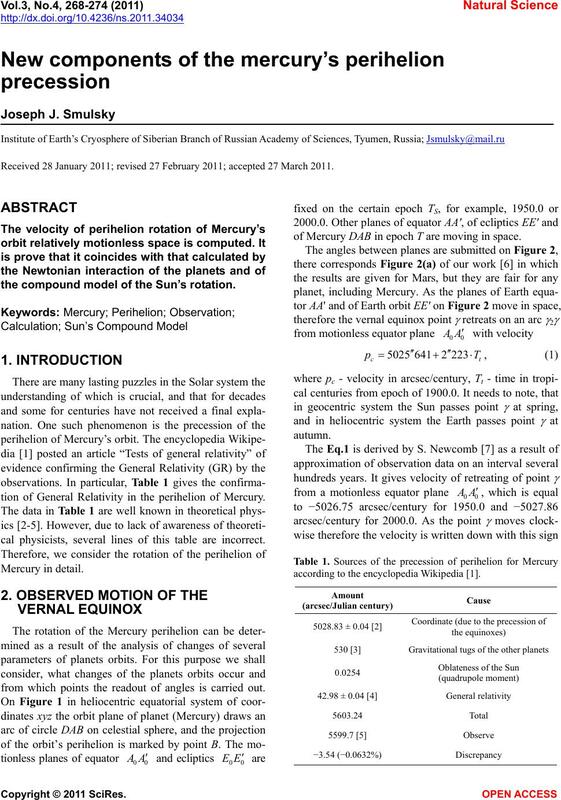 tion of General Relativity in the perihelion of Mercury. cal physicists, several lines of this table are incorrect. from which points the readout of angles is carried out. of Mercury DAB in epoch Т are moving in space. according to the encyclopedia Wikipedia . is - 5028.82 arcsec per century. relative to the motionless space. days from fundamental epoch 1900.0.
ecliptic EE', caused by rotation of plane GDAB. tic and the orbit of Mercury. as polynomials of 6-th degree. observation. Due to orbits elements by J. L. Simon et al. solute velocity of the perihelion on observations data. rota- tion on observation data does not been determined. bits (see Figure 3), including the rotation of perihelion. dif- ferent time spans, including up to 100 million years. rial points, which interact under Newton’s law of gravity. 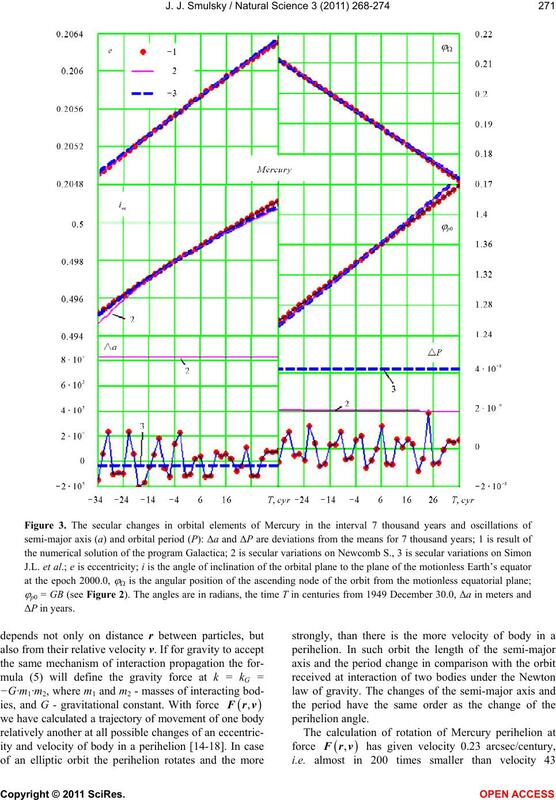 proxima- tions of observation data, made in 1895 by S.
Newcomb  (line 2) and a hundred years later by J. L.
but not at 43 arcsec per century, as previously thought. the data of observation [9,10]. on the equations and results received by Paul Gerber. 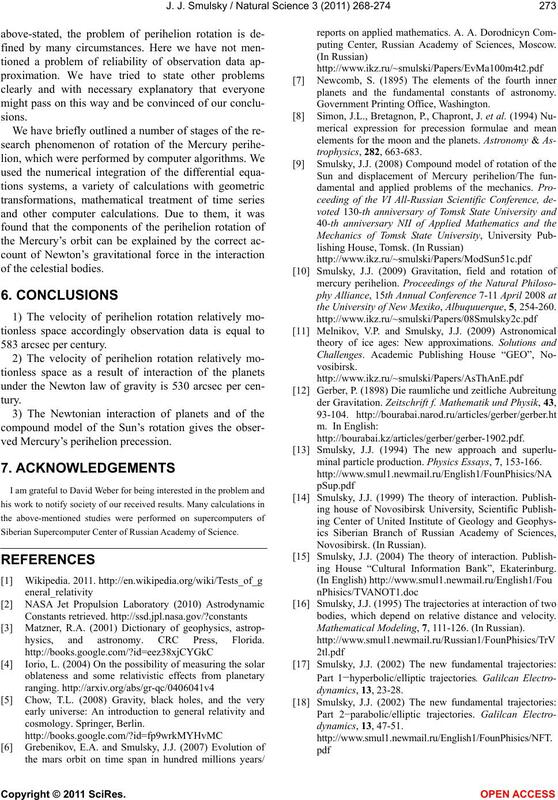 of gravity interaction propagation with speed of light. influence of the Sun oblateness, most likely, are doubtful. the action of other Solar system bodies. tion of its orbit is received of 53 arcsec per century, i.e. 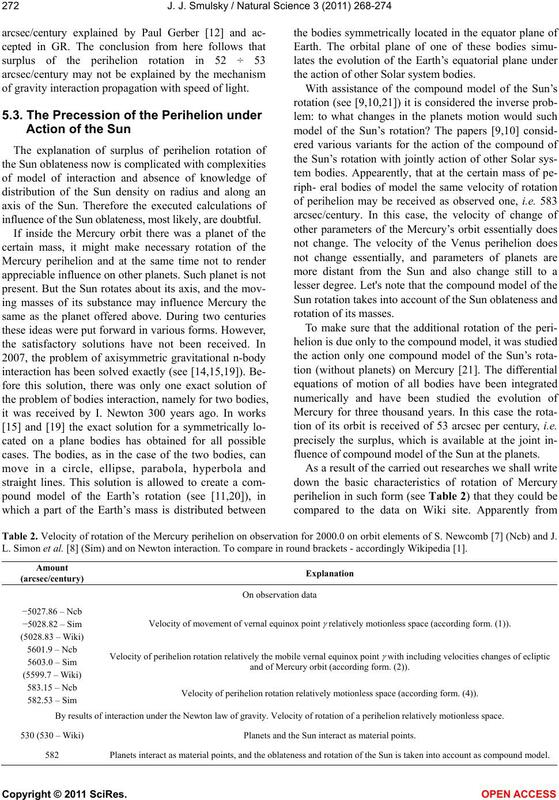 fluence of compound model of the Sun at the planets. Table 2. 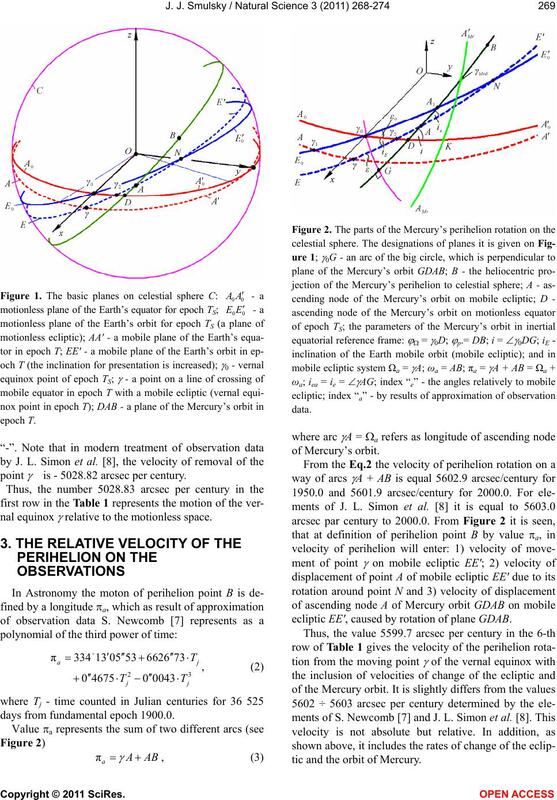 Velocity of rotation of the Mercury perihelion on observation for 2000.0 on orbit elements of S. Newcomb  (Ncb) and J.
L. Simon et al. (Sim) and on Newton interaction. To compare in round brackets - accordingly Wikipedia . relatively motionless space (according form. (1)). and of Mercury orbit (according form. (2)). 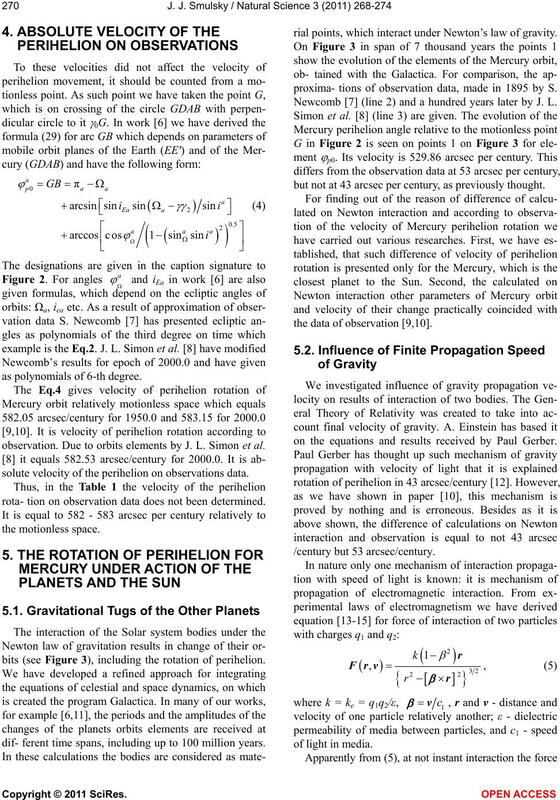 582.53 – Sim Velocity of perihelion rotation relatively motionless space (according form. (4)). By results of interaction under the Newton law of gravity. Velocity of rotation of a perihelion relatively motionless space. 530 (530 – Wiki) Planets and the Sun interact as material points. 582 Planets interact as material points, and the oblateness and rotation of the Sun is taken into account as compound model. Siberian Supercomputer Center of Russian Academy of Science. hysics, and astronomy. CRC Press, Florida. puting Center, Russian Academy of Sciences, Moscow. planets and the fundamental constants of astronomy. the University of New Mexiko, Albuquuerque, 5, 254-260.
minal particle production. Physics Essays, 7, 153-166.
ing House “Cultural Information Bank”, Ekaterinburg. bodies, which depend on relative distance and velocity. Mathematical Modeling, 7, 111-126. (In Russian). 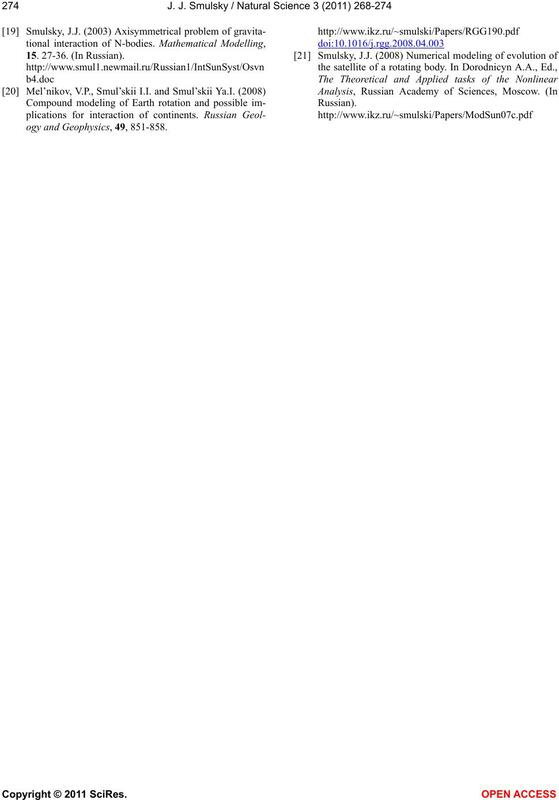 ogy and Geophysics, 49, 851-858.